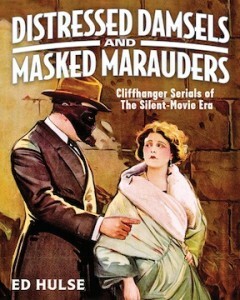 Nearly 11 months ago I announced that the long-awaited Distressed Damsels and Masked Marauders (aka The Bane of My Existence) was nearly ready for publication. Alas, this cursed project had to be back-burnered yet again, and now almost another year has passed. It was my hope — indeed, my determination — that DD&MM would be finished and printed in time for this year’s Windy City Pulp and Paper Convention, but my loss earlier this year of Murania art director Chris Kalb (whose design work is currently very much in demand and earning him far more than I can afford to pay) threw a monkey wrench in my plans. With a little help from another graphic designer, I did my own layouts for the three latest Murania Press publications: The Wilderness Trail, The Best of Blood ‘n’ Thunder: Volume Two, and the new double issue of Blood ‘n’ Thunder — all of which had been promised for delivery at Windy City. (Fortunately, Chris was able to design covers for the two trade paperbacks.) I simply didn’t have enough time to polish off DD&MM as well. Now, however, having just finished shipping the new books to dealers and subscribers, I’m focused like the proverbial laser on the silent-serial book. The manuscript was done a long time ago, although while the book was sidelined I continued adding facts I had uncovered in the interim. A legal challenge some time back might have prevented me from reprinting exclusive material, but after a lengthy and nerve-wracking struggle I prevailed, finally getting out from under the threat of an injunction. But at last the text pages have been laid out and proofread, with only minor editorial corrections needed as I write these words. The single most time-consuming problem I’ve faced has been doing justice to the book’s 300-plus illustrations, a sizable number of which are nearly 100 years old. I have spent hundreds — no, make that thousands — of hours doing Photoshop repairs to the still photographs, newspaper cuts, line drawings, and poster scans that accompany DD&MM‘s text. Some stills suffered from “hypo” deterioration, which I minimized by using Adobe software to recreate sections of the images. Original ads clipped many decades ago from newspapers and pressbooks were torn, chipped, and in some cases badly faded. These, too, required digital fixing; often I had to enlarge images ten times their original size and do repairs on a pixel-by-pixel basis. This type of work isn’t brain surgery, but it requires tremendous patience and lots of time, especially if one isn’t an experienced graphic designer schooled in the intricacies of Photoshop. Perhaps my biggest mistake in estimating DD&MM‘s availability was underestimating the amount of time I needed to finish this work. Several deadlines were further pushed back by the acquisition of stills even better than those I’d had originally included to represent certain titles. Happily, the process is finally drawing to a close. Having cried wolf so many times about this book, I’m reluctant to announce another definite publication date I might miss. But this time I really am close to completing the damn thing once and for all. It’s now largely a matter of finishing the picture pages, plugging in (or correcting) captions, and reworking the index to reflect added material that changed page numbering. Then it’s up to my printer to deliver a proof copy that does justice to all the work I’ve done on the illustrations. Once I okay the proof, finals will be printed and shipped. Bottom line: We’re looking at weeks, not months, before copies are ready for delivery — and this is absolutely the last time I’ll have to say so. To those who pre-ordered the book and have been extraordinarily patient, I can only repeat what I’ve said privately, one on one: If after reading DD&MM you don’t think it was worth the wait, I’ll refund your money in full, no questions asked. That’s how certain I am that the final product will surpass my original hopes for it. I hope that I’m not forgotten, either, as I paid in March 2010 at Cinefest! Has DDMM been published yet? It’s been over four months since the last announcement.